Original artwork by Okacha (@petitokacha). After World War II, Egyptian teacher, Ahmed Fahmy Abu al-Khayr, ran a monthly magazine called ʿĀlam al-Rūḥ (The World of the Spirit). In its heyday—from 1947 to 1960—it featured articles on the science and history of communicating with spirits. It also included advertisements for spiritual healers and translations of texts from spiritualist magazines around the world—all run from Abu al-Khayr’s house on Roda Island in Cairo. Abu al-Khayr produced an issue of ʿĀlam al-Rūḥ every month until his death in 1960. After 1960, the magazine continued to publish, albeit on a less frequent schedule, under the name Al-Rūḥ (The Spirit). Although published in Egypt, its readers and contributors came from across the Islamic world. They were excited to share their spiritualist experiences with the like-minded readers of ʿĀlam al-Rūḥ. In the early to mid-20th century, many magazines closed down after a few years of operation if they were lucky, paling in comparison to ʿĀlam al-Rūḥ’s thirteen years. Proponents of spiritualism—which attracted a considerable following in the 20th century but has now been treated as an eccentric and unorthodox movement, especially by modern secularists—were involved in a serious attempt to reconcile science and religion, providing logical explanations for what had previously been thought of as supernatural and metaphysical. This magazine stands as a tribute to these pioneers and its pages provide fascinating accounts of the séances that Arab spiritualists were conducting in the heyday of the movement. The methods that mediums used to communicate with the dead varied, and there do not seem to have been any specific requirements for the status of ‘mediumship.’ They could be either men or women, young or old. For example, one of the regular contributors to the magazine, Dr. Salama Rufaʾil Saad, enlisted both his wife and his son to help him contact the world beyond. His wife acted as a vessel for the Egyptian neoclassical ‘Prince of Poets’ Ahmed Shawqi, who died in 1932, and his son was the medium for a new ode by another deceased Egyptian poet and nationalist, Hifni Nasif. In another example, Hosni Kanaan, a contributor from Syria, describes a séance in Damascus in 1959 in which the medium’s body would go stiff before speaking in the voices of the dead. One Egyptian attended a meeting in Indonesia where a skeleton was dressed up in a suit and a mask. After the attendee asked some questions, the skeleton’s hand would move and write its answers on a chalkboard or piece of paper. Other times, a medium would become the vessel for the spirit to write a message rather than to speak; the medium would enter a trance and produce a small note. Then, someone in the crowd would invariably confirm that it was, indeed, in the handwriting of the deceased and that the note must be genuine. 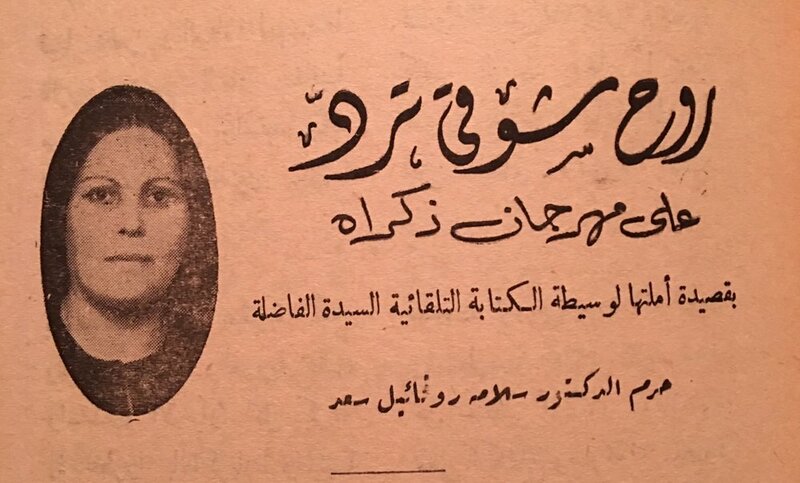 Advertisement for a poetry recital by “the wife of Doctor Salama Rufail Saad.” Ālam al-Rūh, p. 11, January 1959. Most interestingly of all, during Ālam al-Rūḥ’s thirteen years of operation, the spirits contacted situate the magazine’s audiences’ concerns firmly within the twentieth-century Arab world. Furthermore, the figures who communicated with the Arabic-speaking spiritualists from the other side—namely artists and political figures—and the information they conveyed to their audiences gives a rare insight into the interests and concerns of Arabic-speaking spiritualists in the mid-twentieth century. To start, ʿĀlam al-Rūḥ’s spiritualism is characterized by explicit attempts to produce, predict, and influence. Additionally, a common request from spirits was the desire for their deaths to be properly remembered. In 1942, for example, Beirut’s attorney general, Dimitri al-Hayek, attended a séance at the same house where Khalil Jubran appeared. He managed to reach the spirit of his father, Yusuf al-Hayek, who was famous for his anti-Ottomanism and his related death in Damascus by Turkey’s hand during World War I. Yusuf told his son that he needed to secure justice for his father’s death. But the souls of the dead also loved to meddle in their family’s business. In the same séance, Yusuf al-Hayek went on to give his son advice about his personal life. He claimed to have known that his son had been seeing a dermatologist for a particularly painful and persistent skin problem. He knew the location of a box of ointment in his house that will help clear his skin. He then made the cream appear in his son’s pocket. After Dimitri reached into his pocket to find the cure to his rash, he left that séance a believer. At another séance in 1959 in Damascus, the mother of one of the members of the group spoke through the medium. She warned her son not to take a second wife, saying that it would not be fair when he already had a wife and children who loved him. Death was no obstacle when it came to parents who wanted to correct the paths of their unruly or wayward children. In addition to giving family advice, the participants of séances also made political predictions. At a séance in Indonesia in 1958, the spirit of Egyptian Prime Minister Saad Zaghloul spoke from beyond the grave. He predicted that Algeria would be liberated from the French, that Arab Nationalism would remain a powerful force, and that Britain would become lower than a second-tier power in the world. Indonesian general Sudirman, who died in 1950, followed Zaghloul, predicting that General Charles de Gaulle would win the upcoming referendum on a new French constitution with 91% of voters in agreement. When asked why the number was high, Sudirman replied that it was because Charles de Gaulle would rig the vote. The dead sometimes expressed interest in events that happened in the world long after they left it. When Huda Shaarawi’s spirit returned during a séance in Egypt in 1960, she asked for a charity to be set up in her name to help Palestinian refugees. Having died in 1947, before the consequences of the 1948 Arab-Israeli War, she could have known little about the exodus of Palestinians during her lifetime. Her spirit still wanted to let it be known that, after her death, she was supporting them. "Tell my people that Shawqi is none other than, the poet of eternal creation. Or he is the pipe, on which this world sings its songs of eternity." Nakhla comments that this poem is very similar to the ones that Shawqi wrote during his lifetime. This legendary poet appeared in more places than Kamal Nakhla’s dreams. He even composed an introductory poem from beyond the grave for Dr. Raouf Ubayd’s book, A Human is a Spirit, Not a Body. Shawqi’s spirit frequently appeared with other poets at his side. At one Syrian séance, he appeared with Hafiz Ibrahim and Al-Mutanabbi, and they all delivered some verses, which they improvised on the spot. Khalil Jubran, who died in 1931, was another common poet to communicate from the spirit world. It is not hard to see why the spiritualists might have been drawn to his work. In his seminal work, The Prophet, he wrote, “for life and death are one, even as the river and the sea are one.” In fact, this metaphysical verse was, in a sense, proto-spiritualist and Dr. Dahesh, one of the most prominent spiritualists in Lebanon in the 1940s saw Jubran as a predecessor to his own work. In 1942, Jubran appeared to pass on some detailed instructions to the attendees at a séance in Beirut. He was annoyed that his memory had not been preserved as he wanted. First, he asked the assembled crowd to tell his friend Mikhail Naimeh to write an article about his life in a journal “like al-Makshuf,” addressing the rumors plaguing his reputation. He then ordered them to move his body from where it resided. The “empty ornamentation” that had been added by “traders in religion” was pure self-aggrandizing arrogance and against his wishes. His spirit informed the individuals gathered that he wanted his grave to be moved to a simpler plot. To this day, Jubran’s body still lies in his original mausoleum, pomp and all. Beyond reporting on séances, ʿĀlam al-Rūḥ carved out a space for spiritualism within the Arab world. But did Abu al-Khayr create a distinct Arabic spiritualism? If he did, he did not do it in the way that we might expect; he did it by situating the Arab world in a wider global history of spiritualism. “Spiritualist practices” have long been a part of both Arab and Islamic histories and cosmologies. In particular, oneiromancy, the interpretation of dreams, has a history that goes back to the Quran, such as Joseph’s dream, in which the celestial bodies prostrate themselves before him. Islamic scholars have written that the dead could communicate with the living in dreams or visions and that the dead spoke the truth in these dreams. For instance, the 8th-century dream interpreter Ibn Sirin, in his Book of Dreams says, “Whatever a dead person tells you about himself in a dream is true, for he dwells in the abode of truth, and he cannot lie when he is there.” He also adds that if you see a dead person whipping someone, then that person must be wrong because the dead cannot commit false deeds in a dream. Appearances of the Prophet Mohammed (PBUH) himself in a dream were said to be particularly trustworthy since the devil could not take his shape (122, Bukhari, Volume 9, Book 87). In early 20th century, the Shaykh of al-Azhar, Tantawi Gawhari, produced spiritualist writings that were grounded both in Quranic learning and contemporary Western writing on psychic science. It is striking, therefore, that ʿĀlam al-Rūḥ, did not devote much space to the discussion of the local histories of spiritualism. Abu al-Khayr did not completely ignore the topic—a few articles appeared, for instance, on “The Spiritualist Dimension of the Quran” or “The Spirit in Sufi Islam”—but it was far from his focus. When Islamic justifications for spiritualism did appear, they were taken from the greats of classical Islamic philosophy, such as Suhrawardi, or from the Quran. However, he was much more likely to turn to contemporary English-language periodicals, such as Psychic Times and Psychic News, or Western spiritualists like Arthur Findlay or Dr. Nandor Fodor. Although classical Islamic scholarship was used to lend some credibility to the spiritualist movement, the magazine shied away from discussing Egypt’s rich traditions that had a close resemblance to spiritualist practices. The most prominent of these was Zar, which is a ritual that involves (in some cases) curing a disease by embodying a possessing spirit and inducing it to stop causing illness. The ceremony, often led by women and accompanied by music, calls upon the spirits in a way similar to a séance. Despite the similarities between local traditions and spiritualism, Zar is not mentioned in any of the copies of ʿĀlam al-Rūḥ that I have seen. For Abu al-Khayr, spiritualism was a science. Any association with “folk practices” like this may have been simply embarrassing. He had to show that spiritualism was compatible with the Abrahamic faiths, but he aimed to be a part of a modern, global movement that could be empirically proven across the world. The articles that were published on the practice of spiritual healing situated it firmly within the sphere of modern medicine. Abu al-Khayr wanted to construct a modern spiritualism situated in a worldwide context, reporting on international spiritualist conferences that took place around the globe. Egyptian spiritualists were proud to be represented at one of these conferences by the Brazilian ambassador to Egypt, who was a keen spiritualist and member of their association. It demonstrated that national borders did not restrict their outlook. In the history of spiritualism, “The East” has long been seen as a place of untamed mysticism and esotericism, that could inspire travelers in search of a world beyond the materialism of the West. The spiritualist pioneer Madame Blavatsky famously went to India with her Theosophical movement, searching for the spirituality of the East. She also went to Egypt for similar reasons. These Arabic spiritualists themselves, however, rejected traditional, local forms of spiritualism. ʿAlam al-Rūḥ’s mission was not to romanticise Eastern spirituality but to show the world that they too were part of a modern, global and scientific movement. View “The Atomic Bomb and Spiritualist Phenomena,” courtesy of Raphael Cormack. Raphael Cormack has a PhD in Arabic Literature from the University of Edinburgh. He is also the co-editor of The Book of Khartoum (Comma Press) and has written for publications including the London Review of Books, Apollo Magazine and The Scotsman.